Do you paint with oils or heavy-bodied acrylics? Do you struggle to get the effect you want? Take a look at the brushes you are using. 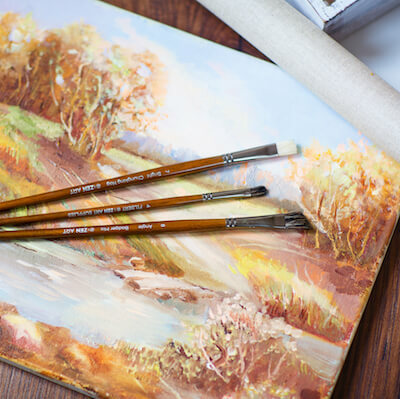 SPECIFICALLY DESIGNED for OILS and ACRYLICS, these popular handcrafted professional paintbrushes have EXQUISITE, LACQUERED, LONG BIRCHWOOD HANDLES to give you flexibility and movement in front of your easel. Our 6-piece set of NATURAL BADGER & 30% SYNTHETIC BLEND filbert brushes have the perfect balance of stiff & soft bristles for strong brush strokes & blending. 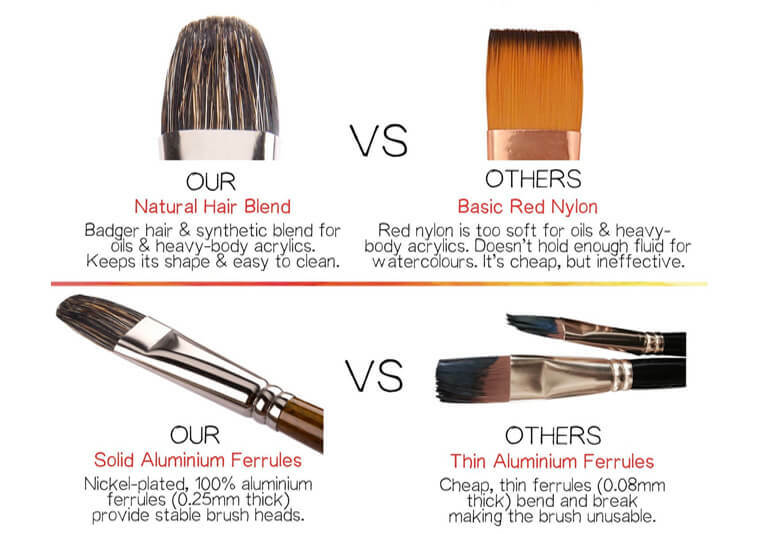 Designed by artists & hand-crafted to ensure a longer-lasting brush that HOLDS ITS SHAPE. Natural-hair brushes can shed but our NATURAL BADGER & JAPANESE SYNTHETIC BLEND brushes minimize the problem with our properly set nickel-plated (to avoid rusting) ferrules and wet testing. And they are EASY TO CLEAN. 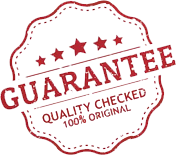 All of our premium paintbrush sets come with a 1 YEAR, 100% MONEY BACK GUARANTEE! And we offer purchase discounts! Buy ANY 2 or MORE ZenArt products and SAVE 10%! Our brushes make the PERFECT GIFT for the artists in your life. Trying to paint with anything less than a professional brush is frustrating. 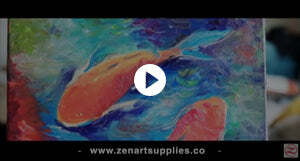 Give the gift of CREATIVITY with the ARTIST'S CHOICE COLLECTION by ZENART SUPPLIES. Have you ever thrown a Paint Brush Away in disgust when it didn’t live up to its hype? There is no such thing as “one brush fits all” and choosing the right brush for your medium is critical for a satisfying session of painting! 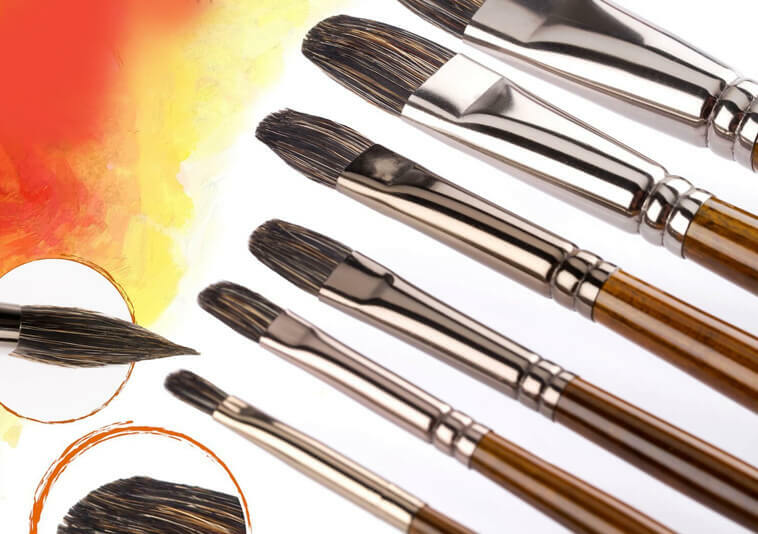 Our Artist's Choice collection features six natural Badger and 30% Japanese synthetic blend brushes designed by a professional artist to use with oils and heavy-body acrylics. 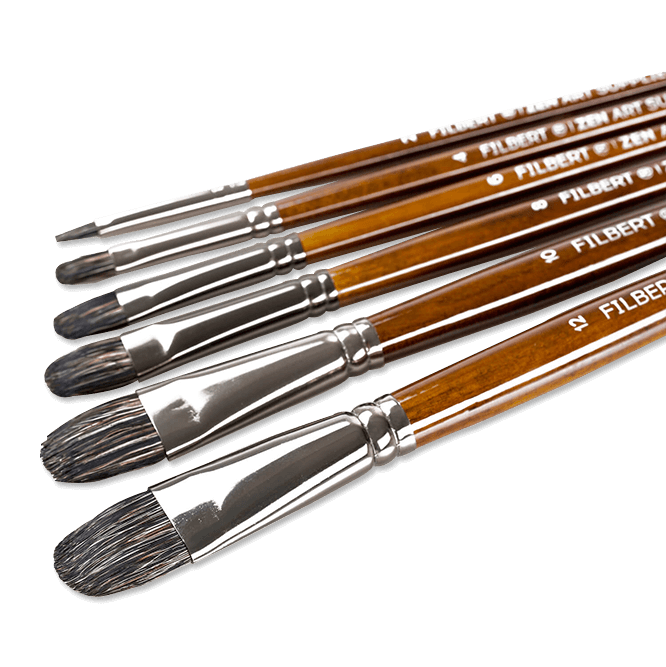 These semi-firm, filbert brushes have just the right amount of stiffness to deliver a variety of marks from thin lines to broad strokes, with the softness you need for glazing and blending. The set includes six brushes in sizes 2, 4, 6, 8, 10 and 12. The Badger and synthetic blend makes them long lasting, easy to clean and keep their shape. The Artist’s Choice set is the perfect gift for the artists in your life! 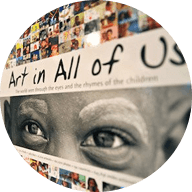 Give the gift of creativity and make a difference when ZenArt donates to Art in All of Us! 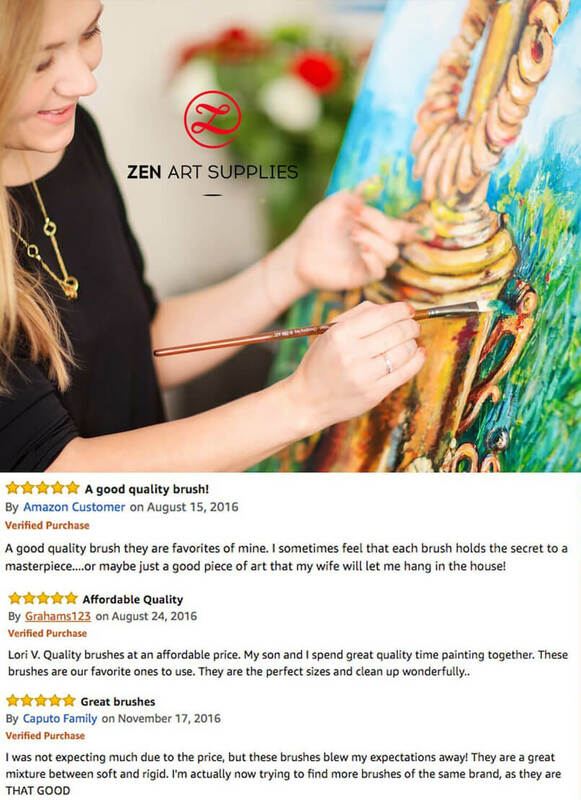 Olga uses our ZenArt oil brushes because they are easy to clean, have the perfect stiffness and balanced handles, and are long-lasting. 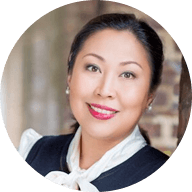 We are very proud to have Olga as our brand ambassador for our oil brushes considering how talented she is! 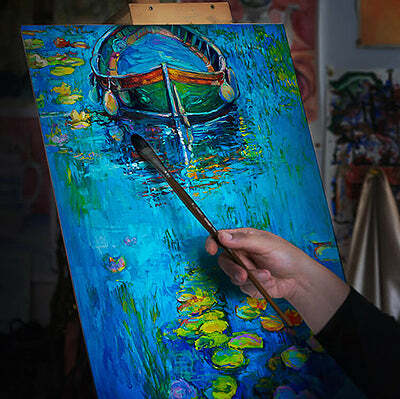 PAINTING in OILS and ACRYLICS is a challenge most artists enjoy, but not when they don't have the proper tools. 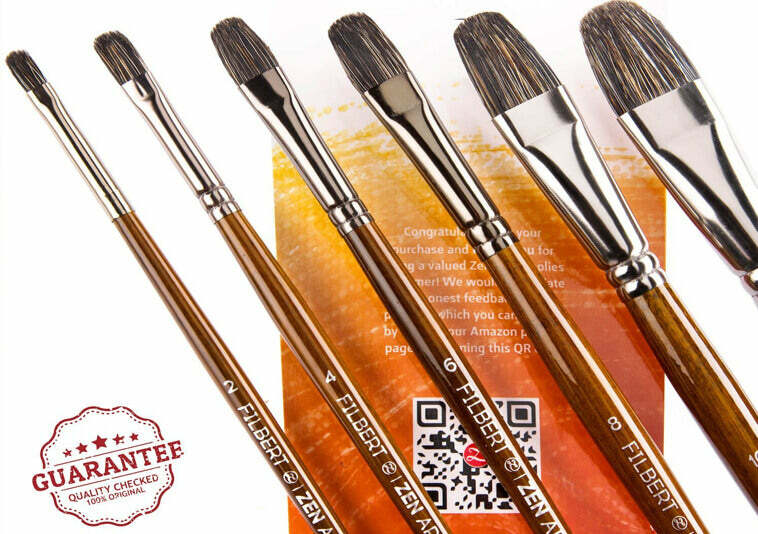 The Artist's Choice collection brushes have ergonomic, long handles and are hand crafted of exquisite lacquered Birchwood to allow you to stand back from the easel for fluid, expressive brushstrokes and to gain a new perspective to your work. Shedding can be an issue with new, natural hair brushes as you break them in, but adding the finest synthetic fibers to our brushes greatly diminishes the problem. In addition, each brush has a properly fastened nickel-plated (to prevent rusting) ferrule and is wet tested to reduce shedding. 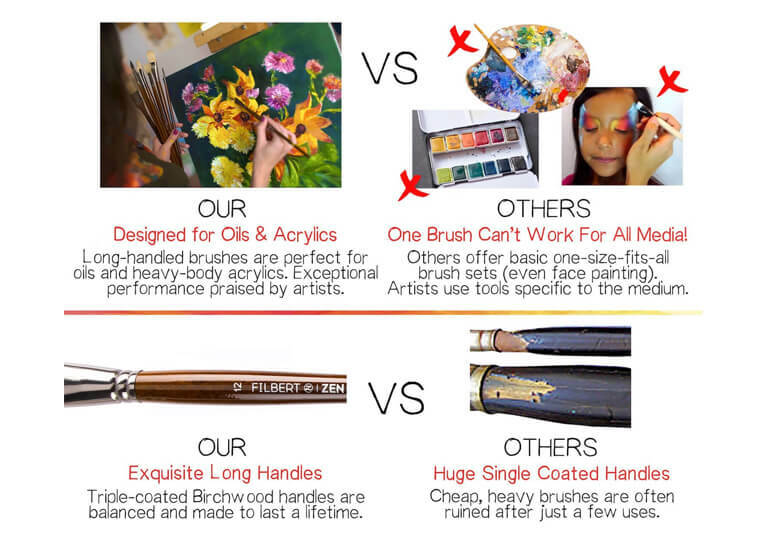 All of our brush collections are designed and tested by professional artists and handcrafted by master brush makers. Professional artists and teachers have reviewed and recommended our brushes. Many artists who have tried the more expensive big name brands have switched to our brushes to get the same quality experience at a more reasonable price. A BRUSH THAT PERFORMS as intended frees the creativity inside every artist! The simple paint brush is the most important tool in an artist’s paint box. Trying to use a low-quality student or hobbyist brush is stressful and discouraging. When it comes to artists’ brushes, money saved is no savings at all! Just imagine how much more productive you’ll be when you apply your paint with a quality brush specifically designed for the work you do! Each of our professional brush sets are designed by a professional artist with YOU in mind! 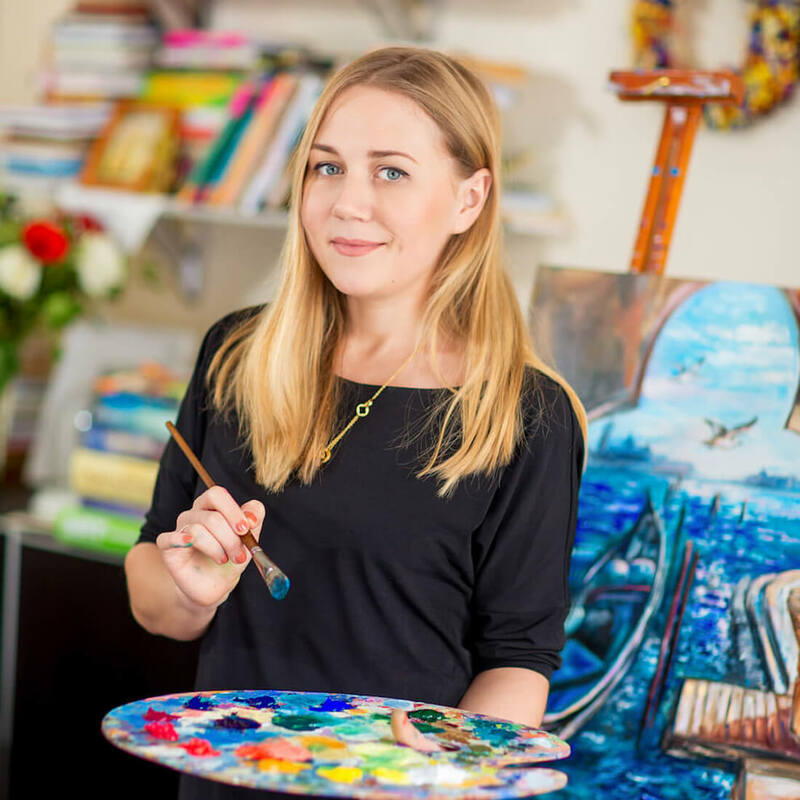 Our Artists’ Choice set is the perfect gift for professional artists and students alike.